Every once in a while we at Quattroholic like to point out those Audi's that really catch our eyes. This is one such car. Sam Williams' B5 bodied Audi S4 is truly gorgeous. In our opinion, one of the cleanest (both literally and figuratively) B5 S4's we've seen. As you can see, Sam likes to keep his S4 spotless. 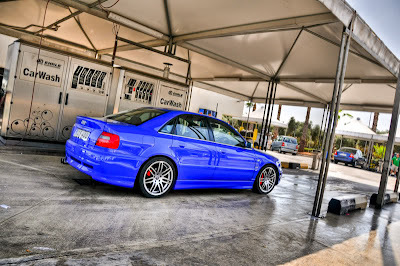 Here are a few pic's of the S4 at the car wash.
Sam's S4 has had numerous performance upgrades and is currently pulling "around 385 hp on race fuel!" Here's a list of his upgrades Giac chip, K&N, Sachs +rs4 clutch & flywheel, RS4 new Wheels, RS4 front & rear bumpers, H&R Coilovers, Denso sparks, m3 spoiler, huge front mount intercooler and VW R32 Mk5 front seats. In addition to being an Audi owner, Sam can also be found cruising the streets of Malta in his blue VW Mk5 R32. Sam can be found on Twitter under the username @legomyaudi and has some great Audi tweets. Here's a big hat-tip to ya Sam, nice ride! Would you like your Audi featured on Quattroholic? E-mail us with photos of your car, and why you think it should be on our page to admin@quattroholic.com. Who knows, your car may be on next week's front page!